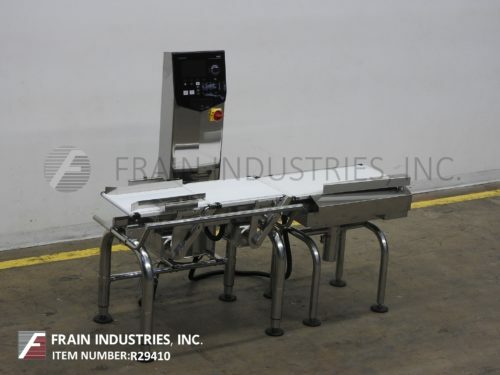 Ishida DACS, automatic, three zone, stainless steel checkweigher rated up to 300 feet per minute – depending on materials and application. Load cell: 14" in Length; 9.5" in Width. Weight range: 6 to 600 grams or 15 to 1,500 grams. accuracy: +/- 0.1 grams or +/- 0.2 grams respectively. Equipped with 14" long by 9.5" wide neoprene in feed conveyor, stainless steel guide rails, 14" long by 9.5" wide neoprene weighing conveyor, two air blast rejects ( one over / one under), 18" long by 9.5" wide neoprene discharge conveyor and touch pad operator interface with visual display. Mounted on a stainless steel frame with height adjustable legs.